A flood defence system devised by CF Møller in central Denmark will combine urban planning, climate change adaption and nature conservation. Described by the Scandinavian architecture firm as an "architectural multi-tool", the Storkeengen is designed to protect the nearby town of Randers from floods and transform the nearby fields into a wetland nature park. A raised boardwalk made from larch planks with a grooved surface will stretch from the town across the new water meadows in a curving path, with a jetty by the bank of the Gudenå River for canoers to embark from. 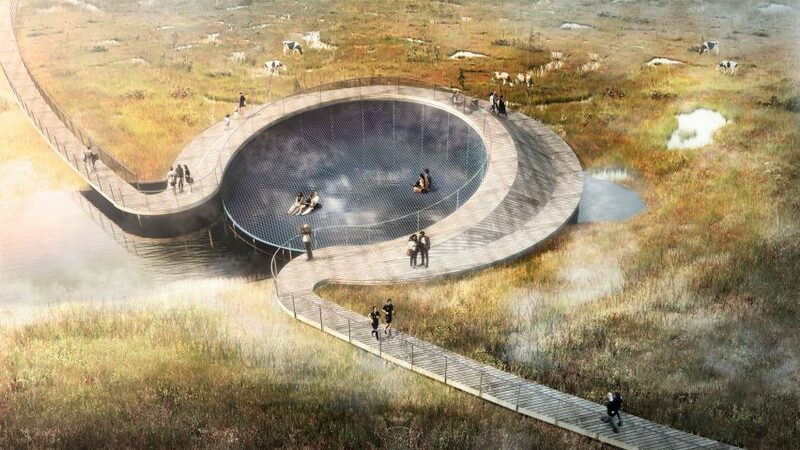 Walking past grazing cattle, visitors will come to a crescent moon-shaped platform in the middle of the water meadows, with pathways diverging either side of a sloping ramp. A rope net will be suspended across the circle for people to sit poised above the water basin. "On the large net one can hover above the wetland and habitats or enjoy the sunset on the tilted web platform," Vilstrup Palm told Dezeen. "The Circle platform targets school classes as well as individuals in order to tell the story of local habitat values, stormwater handling and nature as an integrated part of the city of Randers," he added. Like many Danish towns, Randers' low-lying position has made it vulnerable to flooding, a threat that is only increasing as climate change continues to cause rising water levels and stronger storms. The problems of its geography and urban expansion has been exacerbated by rising levels of the Gudenå River and "extreme" amounts of rain in recent years. The hybrid approach of Storkeengen, or Stork Meadow, will transform the grasslands that lie opposite the town and the river into watermeadows. "The project is a perfect example of CF Møller Landscape's holistic approach, whereby we combine climate protection with urban and nature development," said Lasse Vilstrup Palm, an associate partner and head of CF Møller Landscape. Rainwater run-off from roofs, car parks and roads in Vorup will be channelled through "cloudburst routes" and filtered through the water meadows, which will function as purification basins before flowing back into the Gudenå River. Redesigned roads and drains will prevent water building up in areas where non-porous surfaces prevent natural drainage. Although the natural landscape will be transformed, the grasslands and their existing ecosystem are currently also threatened by the floods. The project will be undertaken in collaboration with with Danish technical advisors Orbicon. Work will begin in the autumn of 2018, and is due for completion in 2021. Rising water due to climate change has become a pressing concern for urban planners around the globe, with architects and designers under increasing pressure to develop integrated flood management systems. The streets of Copenhagen are currently being used to test a new drainage tile designed by architecture studio Tredje Natur, which should divert rainwater into nearby planters. In Tianjin, landscape architects McGregor Coxall designed a wetlands area called Lingang Eco Park as a pilot for China's Sponge City programme, which harnesses permeable materials and green zones to prevent urban flooding.